Although not particularly known for its skyscrapers, Latin America will soon have their very own eco tower to add to the growing mix of green skyscrapers all over the world. Torre Reforma, designed by Mexico-based LBR&A Arquitectos, will be Latin America’s tallest building coming in at 244 meters (800 feet), which will put it in somewhere around 180 on the list of the world’s tallest skyscrapers. Even more noteworthy than its height though is that the building is aiming for LEED Platinum certification and will hopefully encourage a wave of green building in Mexico City and the surrounding regions. 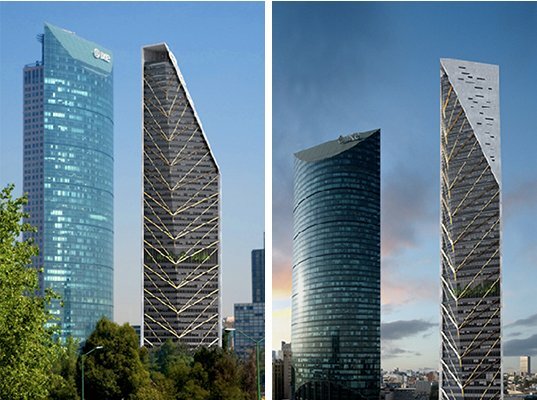 Located in downtown Mexico City, Torre Reforma, a 46 story mixed-used development, will sit across the street from Torre Mayor. A historic gothic-style building, which currently exists on the site will be dismantled and rebuilt on the corner of the site and underneath the tower. Inside, the tower will have restaurants, retail, 18 floors of apartments and 26 floors of office space. The tower is currently under construction and is expected to be completed in late 2011. Halfway up the tower, a two story garden resides in the heart of the building and acts as a vertical park for residents and employees. Floor to ceiling glazing will reveal the park to the exterior and afford views to those inside. On the upper levels, the structural cross bracing membranes, which help stabilize during an earthquake, are visible. The south side of the tower is wedge-shaped and covered in photovoltaic panels to produce power for the building. At night, windows are automatically opened at night to help flush heat from the building. LBR&A Arquitectos has designed the eco tower in hopes of achieving LEED Platinum certification, which will hopefully spur on more green building projects in Latin America. Although not particularly known for its skyscrapers, Latin America will soon have their very own eco tower to add to the growing mix of green skyscrapers all over the world. Torre Reforma, designed by Mexico-based LBR&A Arquitectos, will be Latin America's tallest building coming in at 244 meters (800 feet), which will put it in somewhere around 180 on the list of the world's tallest skyscrapers. Even more noteworthy than its height though is that the building is aiming for LEED Platinum certification and will hopefully encourage a wave of green building in Mexico City and the surrounding regions.